She's a perfect fit for the urban hipster targeted with the launch of Concert Properties' new condo development, The KIP District! Working with the very talented Susan McIntee, Creative director at 52 Pick-Up, Alanna has provided a total of six illustrations which will be used across all marketing materials. Here are five of them featured on the official KIP website launched today! Uppercase's Special Surface Pattern Design Guide featuring a fabulous collection of surface designers, including Alanna Cavanagh, is now available! Alanna's designs have been featured on products by Lord & Taylor, TeNeues, One King's Lane, Hudson Bay Company and Crane & Co. To see more of Alanna's art check out her portfolio here. For all you Alanna Cavanagh fans out there... this is a very cool cover image she recently created for the beautiful and always inspiring Covet Garden. Check out page 10 of the story on Glen and Michelle's lovely home and you'll see where the inspiration for the cover came from. Here we are ready for day one! Featuring prints and patterns from participating artists: Sarah Beetson, Alanna Cavanagh, Harvey Chan, Katy Dockrill, Betsy Everitt, phil, Mark Hoffmann, Monika Melnychuk, Ian Phillips, Thom Sevalrud, Tracy Walker and Tim Zeltner. From left: Ian Phillips, me (Shelley Brown), Tracy Walker, Betsy Everitt and Alanna Cavanagh. Our pillow and plate presentation drew a LOT of oohh's & aahh's! Thank you Ian Phillips, for doing such a fabulous job of designing our booth! 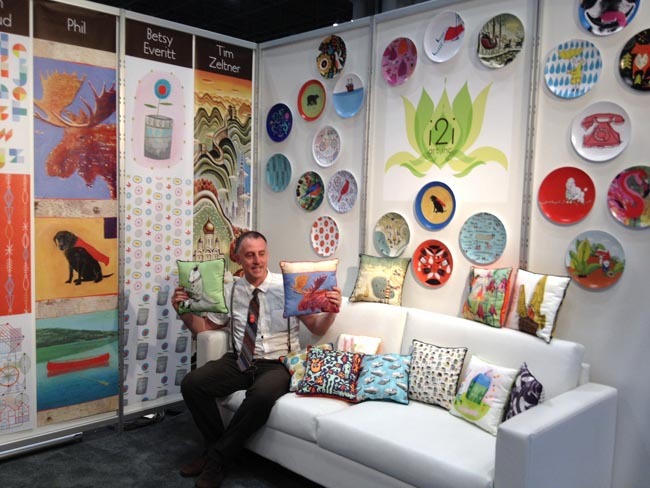 Ian holds up two of our custom pillows seated below our fabulous plates! We held a draw for the pillows and plates following the show. Tina Roth Eisenberg aka Swiss miss checking out our artists' work for some Tattlys! Me (Shelley Brown) with Arren Williams, Creative Director at the Hudson's Bay Company. Print and Pattern features Alanna Cavanagh! 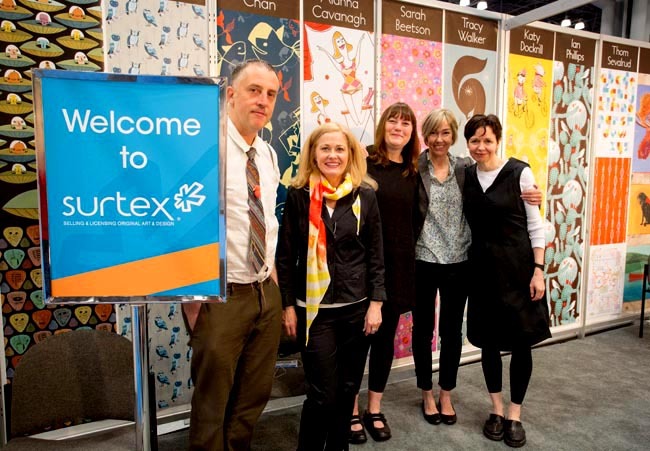 SURTEX begins this Sunday! With this, we are thrilled to share the post Print and Pattern featured on Alanna Cavanagh. If you would like to see more from her collection, and meet Alanna in person, please visit us at booth #340 at the Javits Center in NYC from May 19-21. Alanna Cavanagh's trademark cropped figures are popping up everywhere! Recently Alanna illustrated the cover of Awake and Dreaming. The cover image sends out a gentle yet provocative invitation to join Theo (the main character) on her journey. This is one of 4 new editions to become part of Penquin Canada's Puffin Classics Series, where renowned Canadian illustrators breath new life into classic titles. Art director Lisa Jager did a great job unifying all the covers which you can see on the CBC Books website, where a new edition is being rolled out each day. Alanna's cover debuted earlier this week. You can read more about the interview with her here. The perfect Mother's Day gift (just weeks away)! Alanna Cavanagh's spring capsule collection for Lord and Taylor is now available in Hudson's Bay stores across Canada. On the heels of the overwhelmingly successful Spring and Holiday limited edition tea towels in 2012, we're delighted to announce this spring 2013 launch. Special thanks to the Bay's Creative Director Private Brand Home, Lucia Kinghorn, for bringing this project to life and to Arren Williams, Creative Director Home Fashions for his vision, dedication to Canadian designers and undying enthusiasm for Alanna Cavanagh's work! The collection includes a gardening themed tea towel, canary canapé plates, butterfly mugs, as well as floral patterned apron and oven mitts. Psst...the yellow bird on the canapé plates is inspired by Alanna's pet canary, Lord Percy. 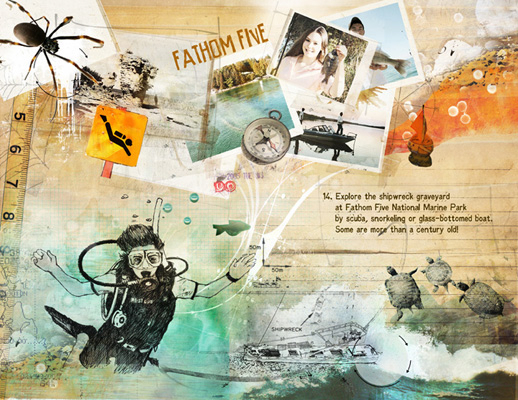 The product development team at the Bay, headed by Pinakin Mistry, did a fabulous job on the packaging of the collection! At this time of year it's all about sharing the season's delicious treats with our friends and family. This lovely fresh image created by Alanna Cavanagh for her holiday surface design collection, was chosen by designer, Margaret Dyer (who has such good taste), of Austen Eliot Communications. It was sent out to her clients as part of a limited edition gift basket presentation. Printed on a beautiful matt stock, the colour just pops! Wouldn't you just love to send this greeting card out next year? In 2013, i2i art will be exhibiting at SURTEX and one of our stationery clients is sure to snap this image up for their holiday line, so stay tuned. Alanna's limited edition Spring '12 tea towel was such a run-away success that The Bay commissioned her to create another design for their Holiday '12 Season. The beautiful 100% linen tea towels are produced by Ulster Weavers, who have the Royal Warrant to Queen Elizabeth II for Kitchen Textiles. By the way, they look stunning framed, (if you can't bring yourself to get yours dirty)! The Bay, in their press material says: "A talented Canadian illustrator and printmaker, Cavanagh’s witty and playful point of view has caught the eye of magazines like Canadian House & Home and Style at Home, and influential online sources, such as Remodelista and Apartment Therapy." We think "witty and playful" says it all! To see more of the Bay's exciting Holiday and Signature Collections, and to meet the fabulous visionary behind all this juicy stuff, Arren Williams, Creative Director of Home Fashions, check out this great post on Design Maze. If you want to get your limited edition tea towel now, you can make your purchase without having to go any further right here. "I thought of her immediately when I heard Ian Brown was writing about men's shoes" said The Globe's Design Editor Cinders McLeod, on selecting Alanna Cavanagh to illustrate the article My Cinderella Season, for the Focus section of The Globe, Saturday October 13th. We love the Harris Tweed pants she collaged into one of the illustrations. A typical pose one might assume whilst reading The Globe, don't you think? The LCBO has just made exploring their vast wine selection a lot more fun! As part of the overall new branding strategy for wine selection with LCBO, Alanna's illustrations have been featured in three videos exploring Red Wine, White Wine and How to Shop for Wine as well as supporting print materials. They are now featured on the LCBO website here. We had the pleasure of working with a great group at Blammo Worldwide including: Creative Director, Andrew Simon, Senior Art Director, Grant Cleland, Senior Art Director/Designer and Kristin Vekteris, VP Director of Client Services. The video animation was done by the talented folks at Poster Boy. Below are screen captures from the 3 videos. This week The Bay launched a limited edition series of Canadian Designer Tea Towels. The beautiful quality linen towels are made by the UK's Ulster Weavers (who hold the Royal Warrant for supplying textiles to the Queen!). Arren Williams, Creative Director of Home Fashions at The Bay gave three designers, including our very own Alanna Cavanagh, the theme of ‘Spring’ and the creative freedom to run with it. They printed a limited edition of 1,000 of each design. We are thrilled The Bay is doing this, and word is, the next series is already in the works. Alanna's vibrant design is available online - check it out here. Due to popular demand they are temporarily out of stock, but check back on Monday, April 30th--there should be more available then. Alanna's lovely illustration accompanies an article on what women want sexually, for Best Health. Her elegant hand-lettering helps tell to the story. We are seeing a growing trend whereby illustration is combined with photography. Below are a few examples of different approaches. Sometimes the client supplies the photos, although frequently the illustrator shoots their own photos or stock photos are used. Greg Stevenson created the hand-lettering and icons layered over the photo of Jeff Bridges, supplied by the client, Ink Publishing. 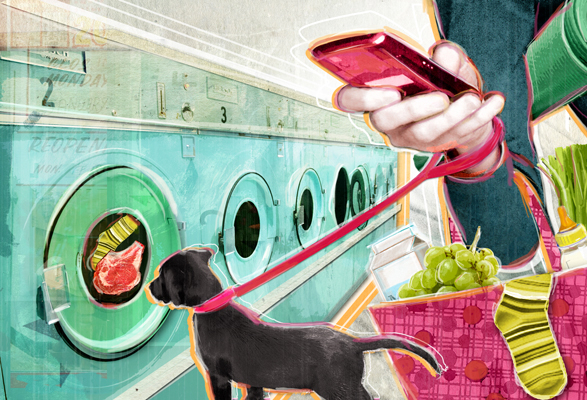 Anne Horst created a montage of stock photos and illustration to create this image on social media for the cover of Marymount Manhattan College Magazine. Alanna Cavanagh's minimal and whimsical line illustrations create a great contrast with the rich fabrics in the photo supplied by Fabricut for this Trend Drapery ad. John Webster created this piece with stock imagery and client supplied photos of Sorbara Hall on the St.Michael's campus at the University of Toronto. The article was on the history of the use of the campus in film. Aaron Bihari used a photo with a duo-tone treatment for the background in this piece, to contrast with his illustrated VW bus. This is an example of how Janice Kun creates a dream-like image with the use of her own original photography as well as stock imagery. Margaret Lee often sets up her own photo shoots on location and uses a unique colorization to create whimsy and drama. Bruce Emmett often stages elaborate sets, with himself as a model, in his photo-illustrative work. 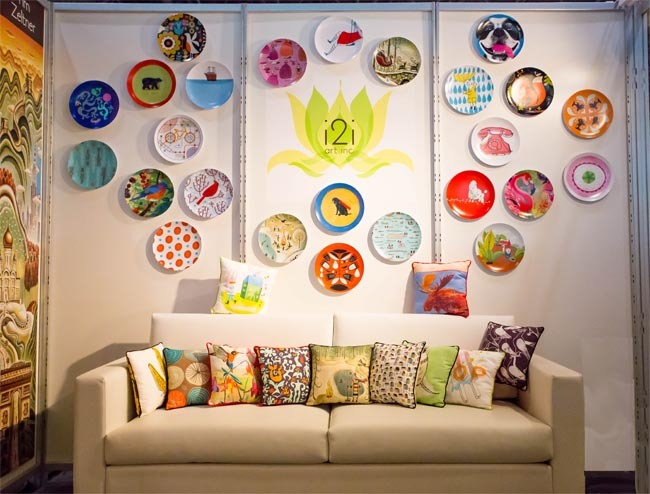 Margot Austin, the Senior Design Editor of Style at Home, recently hired Alanna to create a mural (wallpaper) for their booth at this year's IDS11. The interior design show is held at the Metro Toronto Convention Centre from January 27 to January 30, 2011. Alanna in front of the mural on opening night. It seems to be "travel" month at i2i. Alanna Cavanagh created a fashionable view of trips to Paris for Hemispheres Magazine, Ian Phillips supplied these incredible maps of walking tours in 5 cities for Viv Magazine and Tim Zeltner continues to create amazing landscapes for United with art direction from Barrie D'Rozario Murphy. If you happen to pick up any of the books illustrated by the i2i illustrators, you could swing by Good Egg in Kengsinton Market to pick up a bookmark, illustrated by Alanna Cavanagh. Alanna Cavanagh Lends Her Line to UK Cover of "Hello Heartbreak"
Alanna Cavanagh worked with Art Director Justinia Baird-Murray to create this fun, whimsical new cover for the Penguin UK paperback edition of of Hello Heartbreak by actress and author Amy Huberman. Alanna says this was a fabulous project as it combined two things she loves to draw: cropped figures and hand lettering. If you're considering adding this to your summer reading list, please note this cover is unfortunately only available in the UK. 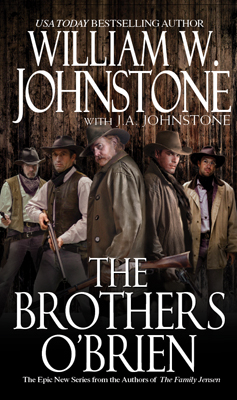 Maybe the new cover will be picked up in North America as the cover itself is receiving rave reviews, as noted by Leah at Chick Lit Reviews .